You may be the biggest dog lover in your home, but you're also honest about the mess that delightful little fur-ball can stir up on a daily basis. Your dog has: chew toys, pull toys, squeaky toys and balls of practically every color strewn all over your home. This collection competes for space with a dog bed – or large cushion – leashes and collars, grooming tools and bags of treats. Designate a docking station to serve as “doggie central.” This station should serve as the primary place where you store all of your dog's food, treats, toys, leashes, collars and grooming tools. The bigger the station, the better; you'll probably fill the space in no time. For this reason, an old armoire or entertainment center – with lots of shelves and large cut-outs for storage bins – is ideal. Downshift with an over-the-door organizer if you're pressed for space – and even if you're not. These organizers, with pockets from top to bottom, are typically sold for shoes. But with about 24 deep openings, they actually look like they've been custom-made for pet owners. 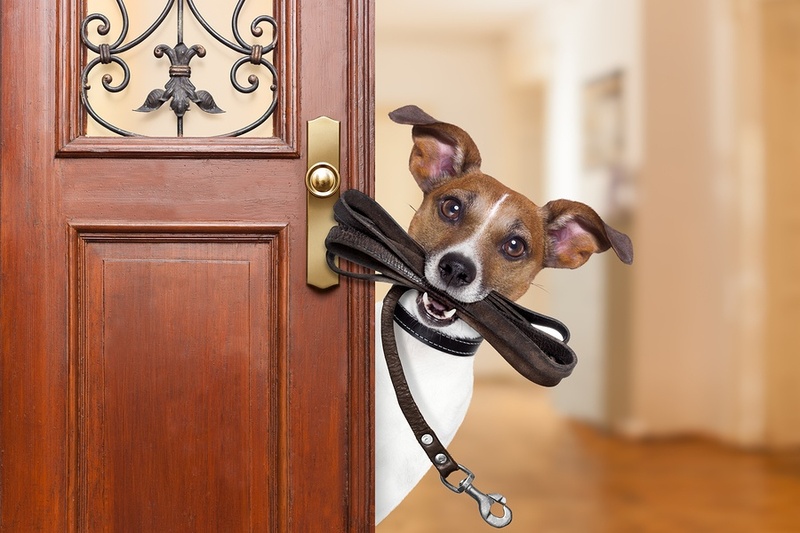 An over-the-door organizer can serve as “doggie central” or as an adjunct for a spoiled pooch who truly has everything. Place a feeding station near “doggie central.” You get the idea: the food is right there; all you have to do is scoop it up and place it into a bowl. Now, if dogs could talk, you'd have it made. Buy an elevated feeding station with food and water bowls. This presumably would be a more comfortable eating position for your dog, who won't have to dip his snoot practically to the floor to nibble on his kibble. But you win, too, because you'll be able to clean around and underneath this messy region. Create a “walk station” near the door where you most often let your dog outdoors. A tall cabinet would be nice, but even a wall-mounted shelf or crate (for treats) with hooks (for leashes) can do wonders as you lead your dog outside for walks and back indoors. Add an extra hook for a sweater or jacket (for you) and you may add more walks to your weekly routine. Invest in motorized shades for all good reasons: to eliminate cords that can threaten your dog's safety, to enjoy the convenience of push-button operation and to add that all-important style quotient to every room in your home in which your dog roams. Make an appointment with a window expert and fellow dog lover from Polar Shades – and shed light on the options that await you from America's foremost shade manufacturer. Contact Polar Shades at 702-260-6110 for a free in-home motorized window shade consultation.